I don't think I've really even shared a Christmas book this year!?! How is that possible? Well, how about I share a bunch today by giving you a round up from our Instagram game! If you are on Instagram but missed out on this just search #doyoureadwhatiread to see all the picks. 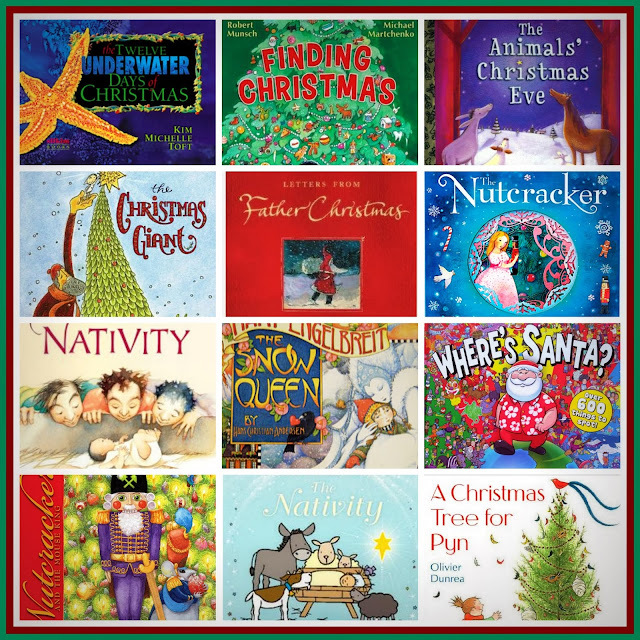 The 12 Underwater Days of Christmas by Kim Michelle Toft looks sooooooo amazing!! And for some reason I can no longer link to it…SORRY! I thought all the Little Golden Book fans might enjoy seeing The Animals' Christmas Eve by Gale Wiersum. The Christmas Giant by Steve Light looks just adorable. It's about a giant who is friends with an elf. And they work together making wrapping paper at the North Pole! Letters From Father Christmas by J.R.R. Tolkien. This was actually a book that Robyn shared that I think is probably fantastic! The Nutcracker: A Magic Theater Book by Geraldine McCaughrean. I think my kids would love this beauty and the amazon blurb says they wouldn't even be able to break it because the characters dance just by turning the pages (no flaps or tabs)! The Nativity by Julie Vivas, is one of my picks. I'm kind of obsessed with it! I wish my version had the cover I've shown above. I wish I had a painting of that illustration to put in my house at Christmas time! So lovely!! The Snow Queen by Mary Engelbreit. A beautiful (and not scary) version! Gorgeous!! Here's a cool look and find: Where's Santa? Around the World by Louis Shea. Dang it! I'm sorry to keep doing this, but this is apparently just for our friends down under! I know how much everyone loves the Usborne Touchy Feely books! Our lucky duck UK friends can get their hands on The Nativity version! Do you have any of these? Of course some of you do because some of you shared them, you luckies!! Guess what, I'm gonna have some of them too, for next year! Yippee! !